There’s a case to be made that J.K. Rowling is getting dangerously close to George Lucas territory, in that she is becoming as obsessed with explaining and connecting the dots in her made-up universe instead of focusing on a compelling story, as Lucas was with the “special editions” of his films. What started as a whimsical story about a guy catching them all has now become an extended Wikipedia entry, and for the first time in 10 films, it has become a chore to see a Wizarding World film. The Crimes of Grindelwald picks up three months after the events of Fantastic Beasts and Where to Find Them, and every character seems to think they are in a different movie. First there’s Newt Scamander (Eddie Redmayne), who still can’t look people in the eye or explain why he is the lead. 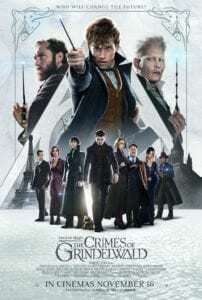 He is back in London and is tasked by Dumbledore (Jude Law) to find Credence (Ezra Miller) – while still taking time off to have his own adventures with magical beasts. Then characters from the first film show up at his apartment like dwarves breaking into Bilbo’s home (not the first time this film made me think of The Hobbit), namely everyone’s favourite no-maj, Jacob Kowalski (Dan Fogler), who is living in a drama about the relationship between magic and no-magic people. Then we also have Tina Goldstein (Katherine Waterston) trapped in a conspiracy thriller involving Credence’s real identity, something involving the Lestrange family, and an unnecessary prophecy that serves only to make sure we know every character is super special and important. Why is Newt the only one capable of facing Grindelwald? Why is Credence suddenly a key to everything? Who is Leta Lestrange? The film, written by J.K. Rowling, never gives much in the realm of answers. And I’m only mentioning about a third of the characters that show up in The Crimes of Grindelwald. The best and most surprisingly fun part of the first Fantastic Beasts had all to do with its eponymous beasts and nothing to do with the Potter-connections and evil wizards. Likewise, the most (or only) fun to be found in The Crimes of Grindelwald involves magizoologist Newt preventing a giant creature from wreaking havoc. Redmayne still captures the odd charm of Scamander, who loves creatures more than people, even if it doesn’t make sense for him to be the lead character. The creatures old and new and a pleasure to watch, as fan-favourites like the kleptomaniac Niffler return and are as cute and funny as ever, or the new additions like big feline Zouwu which pose as big a threat as they provide smiles. Unfortunately, the film falls into CGI over-reliance, specially when it comes to the sets, which aren’t distinct enough to justify having to go from London to Paris. David Yates also continues with the same washed-out aesthetic he’s used since Order of the Phoenix, only this time it looks darker and muddier than any previous films, literally. Nowadays we’ve grown used to films trying to set up a larger universe from the get-go that the idea of the middle chapter serving only as table-setting isn’t new. The problem with The Crimes of Grindelwald is that Rowling shows zero care for the film you are watching, and instead focuses on getting it done as quickly as possible in order to move on to the next sequel. It proves so by quickly undoing much of the ending of the previous film by providing quick cutaway lines that explain why Credence is still alive or why Jacob has his memory back. The film is filled with forced coincidences and contrived explanations in order to have everyone be where they need to be to further the story, and it becomes both confusing and uninteresting. It hints at what Rowling really is interested in and values in the story, as the script seems too concerned with plotting out endpoints and hinting at a future epic showdown that it forgets to think of why we should stick around for the next two sequels instead of skipping to the end. There is an endless parade of new characters that barely amount to cameos, and promises being made on future plot points and seemingly important revelations, but no reason given as to why we should care. Remember when Jude Law was cast as Dumbledore and we all thought it would pay off in this film? Well, think again. The Crimes of Grindelwald may just offer enough spellcasting, magical creatures and reveals to keep fans intrigues until the sequel, but those wanting more than a side dish will be disappointed. The film’s obsession with pointless mysteries and reveals don’t amount to much – at best it will leave newcomers confused, at worst it will leave long-time fans disappointed and enraged.